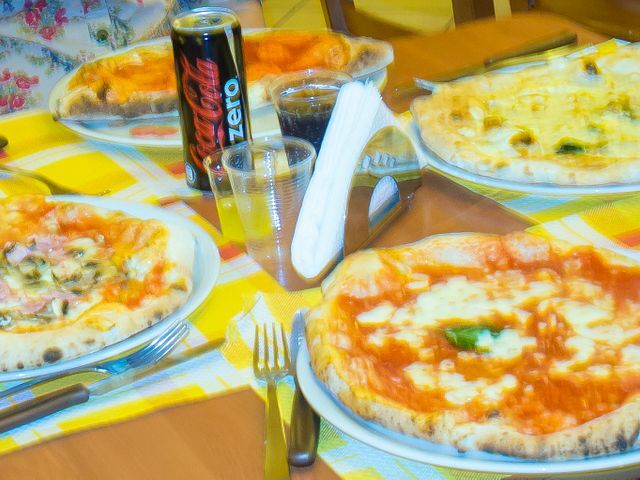 In Italy and got a serious craving for pizza? We sure did. When you get that hit, the "only logical thing" to do is to head over to the metropolitan city of Naples, the land where pizza was invented. An oldest city in Europe. Once a powerful of centre of European Renaissance. This once wealthy kingdom of Naples has seen more than her fair share of conflict. Previously Greek (2BC), Naples has since been been ruled by the Romans, Goths, Spanish, French and then some. In 1656, the deadly Black Plaque, wiped out half the city's population. In World War II, Naples was the most heavily bombed city in the whole of Italy. There is plenty of "physical scaring" around this historic city, along with heaps of trash and less than perfect European polish. For a first timer on a do-it-yourself trip out of a comfortable first-world country, consider skipping Naples and heading straight for the world renown beauty of the Italian Amalfi Coast. We were in Naples for the day. I felt like we were really walking right "on the knife's edge". A feeling of being really alive. Naples is home to the mafia. More specifically, the Camorra - the country’s oldest organised crime syndicate. The stuff on the film Gomorrah (2008, seriously, very mature audiences only!) are all apparently true. After over 8 years since the film was released, the mafia in Naples are still on the hunt for Roberto Saviano, the journalist who wrote the book, which the film is based on. The film exposed the Camorra. Now, Robert travels around with seven trained bodyguards, in two bullet-proof cars. In his new book, Robert reveals how 15-year old children of the Mafia become stone-cold killers. If you see persons that look like mafia in Naples, they probably are. This is a travel story. Moving away from thoughts of potential homicide, we jump back on to the happy food trail .. Via dei Tribunali is hard to find .. it is ridiculously HARD TO FIND. But like all things challenging, your prize awaits at the end of this little Easter-egg hunt for the street that has (arguably) the best pizza in the home city of pizza. Get your GPS-phone out buddies, you will be kidding yourself otherwise. We were starving. We finally found Sorbillo's. I had the most amazing piping hot pizza there. My brain crashed for the next 30 minutes or so as I found my happy place. Having tried pizza from New York to New Zealand, the pizza here is both the cheapest and the most plain looking you will find in the world. But, take a bite, taste, and the rest is history. Order whichever pizza you fancy, but I highly recommend at least trying the four cheeses (Pizza Quattro Formaggi) .. Oh my, Mamma mia. In the words of Gordon Ramsey, "to die for!". 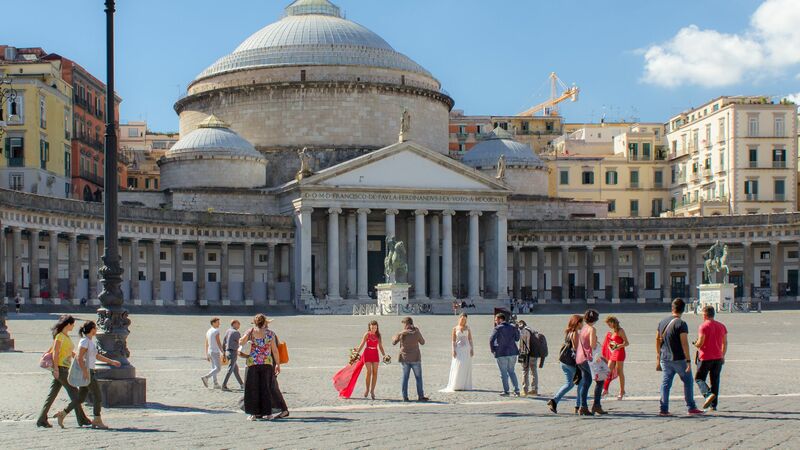 In Naples, "stuff" is going on all the time, you just might not see it. Stay frosty and keep your wits around you. It is a good thing if your stuff (money, handbag, limbs?) remain with you. Keep your wits about you and motorcycles scoot around, sometimes with handbag snatching pillion riders. Good ole Gambrinus, an alfresco style cafe, is a great place for a double shot of espresso. That put a bigger smile on our silly tourist faces and helped us stay sharp. It does not get any better than this. A ribbon wrapped orange sports car swings by the large square, Piazza del Plebiscito, and drops off a bunch of attractive ladies. A photo crew rocks on up and I wonder. Where is the groom? It was a nice clear day. We saw Mount Vesuvius. There across the Bay of Naples, this famed city killer of a volcanic mountain wiped out the entire nearby Roman cities of Pompeii and Herculaneum. Back then in 79AD, it erupted and released thermal energy over a hundred-thousand times that of the bombings at Hiroshima-Nagasaki. An estimated over 1,000 people lost their lives. Today, Vesuvius is an active volcano. We were on the hunt for blood. Specifically, the blood of a Saint Januarius (also known as San Gennaro). In the year 305, this saint died a martyr. He is the patron saint of Naples. His dried blood remains kept in a glass vial, a relic in the care of the Roman Catholic church. On the same 3 days each year, the solid blood of Saint Januarius liquifies (yes, it turns to liquid). This liquefaction of blood has been happening since 1389. On the rare occasion, when his blood did not liquify, locals here take that (very seriously) as a dark omen of impending disaster to the city of Naples - disasters the likes of the 1980 earthquake, the 1973 outbreak of cholera, the 1939 start of World War II, etc, you get the picture .. The blood of Saint Januarius did liquify when pope Francis visited in 2015. Our search took us around the other parts of town. Between the intense graffiti, crumbling concrete, piles of abandoned trash and wet street-side markets, we saw beautiful locals everywhere. They seemed a bit more laid back and relaxed; less hurried as compared to folks in the bigger cities. We arrived at the Cathedral (Duomo) of Naples. Thousands of people gather here three times a year. Inside the cathedral, to the left is the restored 4th-century Basilica di Santa Restituta. To the right, we entered the sacred Cappella di San Gennaro (a.k.a. Chapel of Saint Januarius, and Chapel of the Treasury). We take a moment of silence to absorb the view of the high altar. To the left is the (yellow) clothed silver bust of Saint Januarius. No signs of his blood in sight. Perhaps, that sacred vial is locked away behind the altar; or maybe even in a bank vault elsewhere. We say a short quiet prayer in gratitude. We are alive, limbs and purses intact. We wished for blessings on the people of Naples, who have kindly allowed tourists like us to wander around their city on this day to appreciate of their beautiful artefacts and enjoy what simply is the BEST pizza in the world. 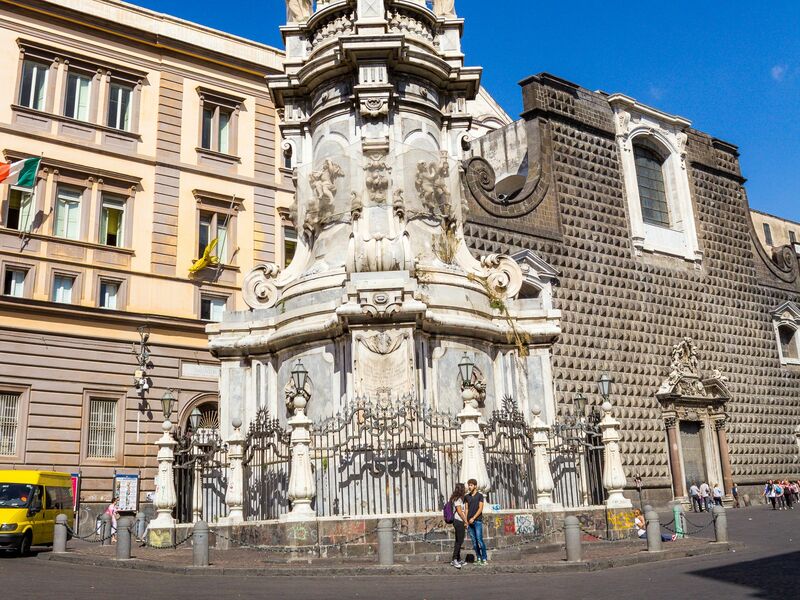 This centre of Naples is a UNESCO World Heritage Site. Grazie mille. Thanks for reading. p.s. If you're looking to do a self-guided tour of this city, you might like this Naples Foodie Itinerary. Visit Naples. Feel and taste what it is like, to be alive!